Even though numerous tattoos look great and have some sort of meaningful reason or memory behind them, several are misguided or ill-thought-out mistakes. Thankfully, laser tattoo removal can help anyone remove regrettable words or ugly pieces of art from their body. But despite the fact that laser removals are the quickest, safest and most efficient way to get rid of a tattoo, several people pursue other methods. Unfortunately, these don’t work as well and can be quite dangerous too, leaving the individual with harmful, sometimes permanent side effects. In this post we aim to educate you about the dangers of non-laser tattoo removal methods, including invasive and “DIY tattoo removal” methods. Before the advent of laser removal machines, people went to remarkable lengths to de-ink their skin. 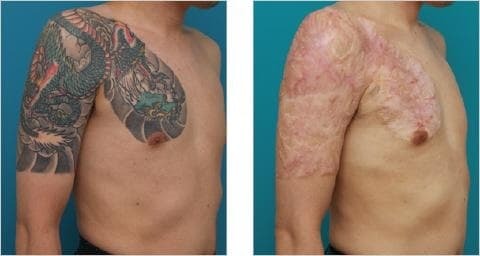 One of these extreme techniques was dermabrasion, which some people are still pursuing today in the hope their tattoos will disappear. 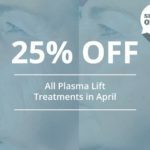 Dermabrasion involves scraping away or sanding down the skin using an abrasive device such as a wire brush, diamond wheel, sterilised sandpaper, salt crystals or other mechanical means. The procedure typically requires a local anaesthetic due to the high level of pain the patient will undoubtedly suffer. If the suffering and thought of skin scraping wasn’t enough to put you off, dermabrasion can also cause scaring, discolouration, bleeding and infection. It can take months to heal properly and might not even have the desired effect. Side effects: Pain, burning, itching, weeping pores, bruising, swelling, scabbing, discolouration, bleeding, infection and permanent scaring. William Portuese (MD), Plastic Surgeon at Seattle Facial, Seattle. Salabrasion is quite similar to dermabrasion, but uses water and granular salt in addition to an abrasive device. Rather than sheer brute force, the salty substance is meant to rub and peel away the upper layers of skin. After vigorously rubbing the region, an antibiotic ointment and sterile gauze dressing is applied and left for a few days before the whole process is repeated again. The salabrasion-affected region of dead skin should start to separate from the healthy skin beneath, pulling the tattoo pigment away at the same time – apparently. However, just like dermabrasion, this method can be incredibly painful, will leave a visible scar and could result in infection. There is also a good chance that the procedure won’t go deep enough to reach the tattoo ink anyway. Side effects: Pain, burning, weeping pores, itching, bruising, swelling, scabbing, discolouration, bleeding, infection and permanent scaring. Phillip Bekhor (MBBS, FACD), Dermatologist at Laser Dermatology, Melbourne. If you thought dermabrasion and salabrasion were bad, then you might not want to read what surgical excision involves, especially if you’re squeamish. For this procedure, the surgeon removes the tattoo using a scalpel and closes the wound with stitches. That’s right, surgical excision involves cutting a tattoo out of your skin under local anaesthetic. While some will claim this is effective for smaller tattoos and offers improved precision, the cut doesn’t usually go deep enough and may not remove all of the ink or pigment. On top of that, side effects include skin discolouration, infection and raised or thickened scars, which won’t appear until three to six months after the procedure and may stick around for life. Side effects: Pain, bruising, swelling, discolouration, infection and permanent scaring. Roy G. Geronemus (MD), Dermatologic Surgeon at Laser & Skin Surgery Center, New York. TCA Peel – TCA stands for TriChloroacetic Acid and will burn away outer layers of the skin. The amount of time this chemical peel is left on the skin will determine how many layers are burnt away. However, all a TCA peel will do is bleach the skin and make it seem as though the tattoo has been removed, when in fact the skin has just been lightened. Glycolic Acid Peel – This contains a mixture of lactic, tartaric, malic and glycolic acid and can be administered at home or by a dermatologist. The solution is meant to inflame the skin so your body can expel the tattoo ink, but it doesn’t get to the root of the problem. Therefore, it isn’t very effective and could result in pain or scarring. 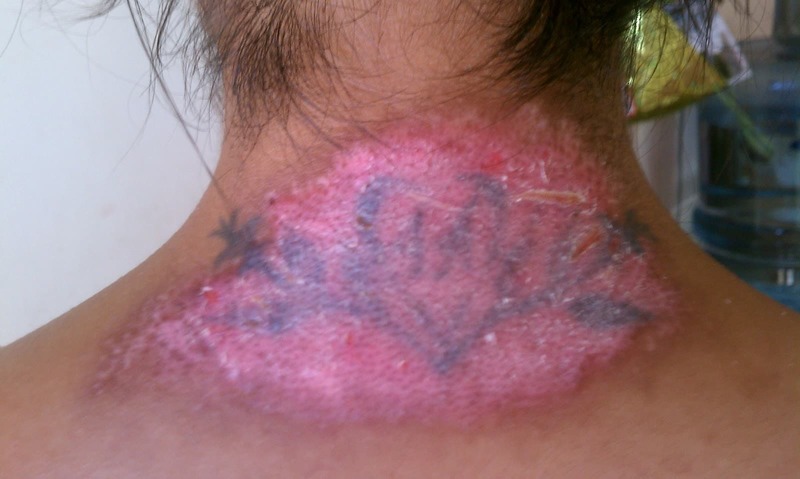 Whatsmore, a recent study showed that fluid lactic acid tattoo eraser caused depigmentation and hypertrophic scars. Side effects: Pain, burning, weeping sores, itching, bruising, swelling, scabbing, discolouration, cicatrisation, infection and permanent scaring. The prospect of a DIY and pain-free cream, which will get rid of your tattoo in next to no time, is one that appeals to several people. But the phrase “If it’s too good to be true, then it probably is,” definitely applies here. These creams usually contain chemicals including hydroquinone, kojic acid, alpha arbutin and TCA, which are meant to dissolve the tattoo from your skin. And while they may slightly fade your tattoo, these removal creams cannot access the layer of skin where ink is stored known as the dermis. In addition to burning and irritating the skin, tattoo removal creams cause scaring, lots of false hope and a rather pointless dent in your bank account. Side effects Pain, burning, bruising, swelling, itching, scabbing, discolouration,infection and permanent scaring. 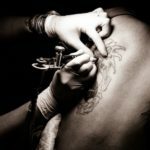 This type of tattoo removal borrows techniques from a few of the other flawed methods mentioned previously. It involves using an inorganic chemical remover developed by Rejuvi Laboratory California, which is applied in the same way as the original tattoo. However, you only have to do a quick search online to uncover various horror stories about this type of removal. 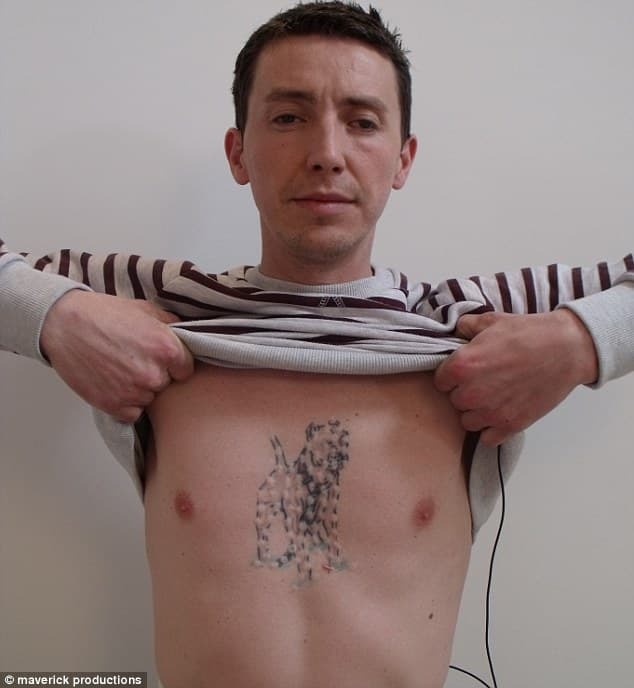 A story on the Daily Mail website shows how the treatment caused one man to suffer from unsightly bumps and scars on top of his tattoo, which is still clearly visible. 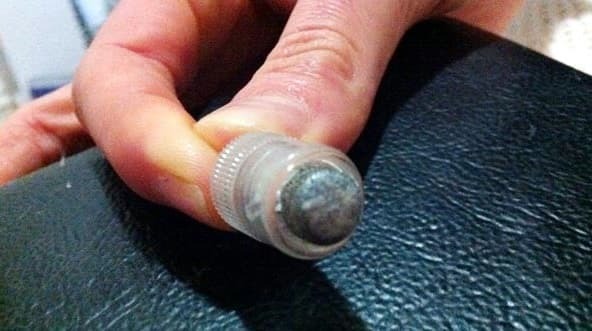 Some unfortunate Rejuvi patients have needed steroid injections to cope with the pain and redness, while others enlisted the services of solicitors due to horrible scaring and terrible results. Side effects Pain, bruising, swelling, itching, scabbing, discolouration, infection and permanent scaring. “Rejuvi involves the tattooing of a chemicals to extract the tattoo colour. I once saw a patient after he had the Rejuvi procedure which had caused extensive scarring. The patient required several treatments with Fraxel to improve the appearance of the scarring. We even published a case report about this. Ritu Saini (MD), Dermatologic Surgeon at NY Medical Skin Solutions, New York. Cryosurgery, also known as cryotherapy, is the process of removing unwanted layers of skin by freezing them off – much like you would do to a wart as seen in the picture below. 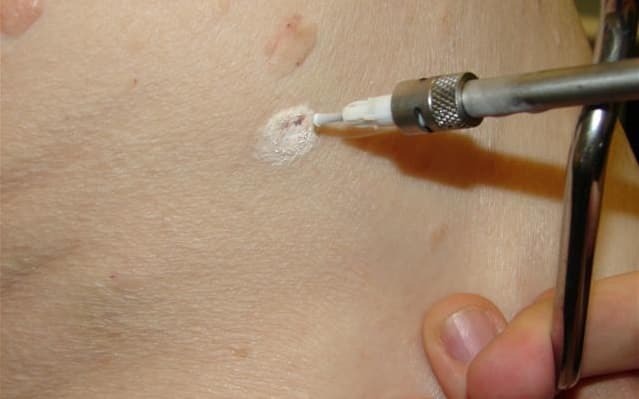 The process is not for the faint-hearted, though; it involves spraying on a freezing agent which induces frostbite, and then sanding layers of skin off the affected area. Because it can be extremely painful, cryosurgery is performed under local anaesthetic. Cryosurgery can damage nearby tissue. Because of its varied results and other drawbacks, cryosurgery is not recommended for tattoo removal. Side effects: Pain, blistering, scabbing,, swelling, discolouration, infection and permanent scaring. Shawn Allen (MD), Dermatologist at Boulder PC, Boulder. It is clear to see that all of the aforementioned methods and procedures have harmful and painful flaws, which usually fail to remove the tattoo anyway.The only way you can guarantee safe and effective results is to choose laser tattoo removal and treatment. You may experience some side effects such as blistering, scabbing, swelling, but these are signs that the treatment is working and the body is healing. What’s more, the latest removal device, the PicoSure laser has a 75 per cent or greater clearance after one treatment. Along with removing tattoos in fewer sessions, PicoSure is FDA approved and has a 97 per cent recommendation rate worldwide. For more information about PicoSure or other laser tattoo removal options, get in touch with Andrea Catton today.